Huey P. Newton was born in Monroe, Louisiana, on February 17, 1942, and named after former governor Huey P. Long. In 1966, Newton and Bobby Seale founded the left-wing Black Panther Party for Self Defense. The organization was central to the Black Power movement, making headlines with its inflammatory rhetoric and militaristic style. Newton was killed by a member of another militant group in 1989. Social activist Huey Percy Newton helped establish the controversial African-American political organization the Black Panther Party, and became a leading figure in the Black Power movement of the 1960s. Newton began to take his education seriously. Although he graduated high school in 1959, Newton barely knew how to read. He became his own teacher, learning to read by himself. In the mid-1960s, Newton decided to pursue his education at Merritt College, where he met Bobby Seale. The two were briefly involved with political groups at the school before they set out to create one of their own. Founded in 1966, they called their group the Black Panther Party for Self Defense. 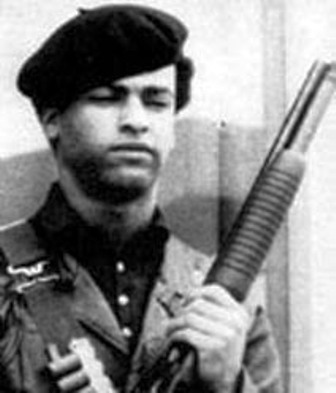 Unlike many of the other social and political organizers of the time, they took a militant stance, advocating the ownership of guns by African Americans, and were often seen brandishing weapons. A famous photograph shows Newton—the group’s minister of defense—holding a gun in one hand and a spear in the other. The group believed that violence—or the threat of violence—might be needed to bring about social change. They set forth their political goals in a document called the Ten-Point Program, which included better housing, jobs, and education for African Americans. It also called for an end to economic exploitation of black communities. Still the organization itself was not afraid to punctuate its message with a show of force. For example, to protest a gun bill in 1967, Newton and other members of the Panthers entered the California Legislature fully armed. The action was a shocking one that made news across the country. And Newton emerged as a leading figure in the black militant movement. The Black Panthers wanted to improve life in black communities and establish social programs to help those in need. They also fought against police brutality in black neighborhoods by mostly white cops. Members of the group would go to arrests in progress and watch for abuse. Posted in Our Story MomentTagged Abundance, africa, African, Afrikan, Ancient, black, Black Community, Black Panther Party, Black Panther Party for Self Defense, Black Power, Black Unity, bobby seale, dream, Education, growth, huey newton, Huey P Newton, inspirational, inspire, knowledge, learning, Prosperity, teens, wealth, wisdom, wise, words, youthBookmark the permalink.